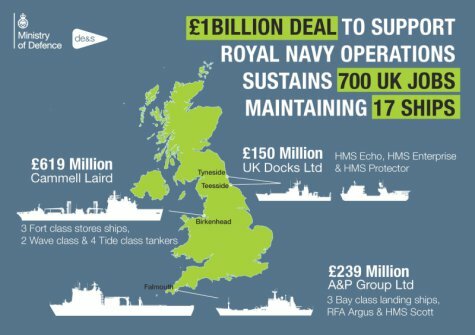 Defence Minister Stuart Andrew has announced that new contracts expected to be worth over £1bn have been signed with British firms to support military ships for the next decade. -- A £150 million contract with UK Docks Ltd on Tyneside to support the survey ships HMS Echo and Enterprise and the ice patrol ship HMS Protector. Defence Equipment and Support acting Chief of Materiel Ships, Neal Lawson said: “Through the placing of these contracts and making changes to the way we provide support under this agreement, we will be able to deliver significant financial benefits.